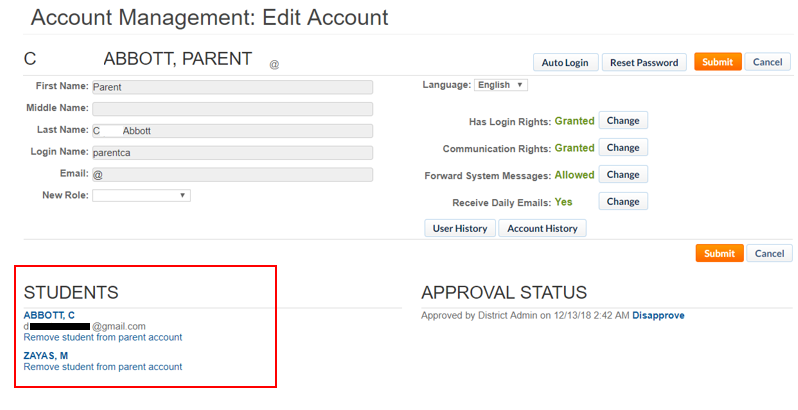 This article describes how a user with Admin access rights can remove a student from a parent account. Navigate to the User Management menu in the top left part of the homepage. Select the Parents tab and click Parents. Select the Parent Account from the list. Parents can also be removed from the student record. The list of students registered under that Parent Account is displayed under the Students section. Click the Remove Student from Parent Account link. The student is removed from the Students section of the Parent Account.